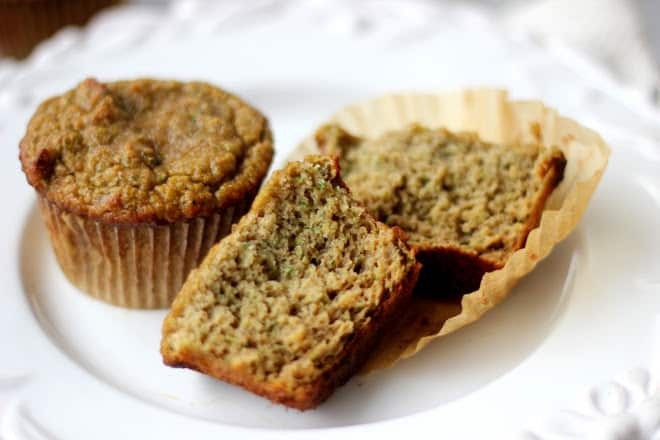 Moist grain-free zucchini muffins sweetened with banana. I need muffins in my life on a weekly basis. They are perfect for breakfast. Great for a weekend brunch with friends. The perfect post-nap/pre-dinner snack for my 2-year-old. And the perfect late night TV watching healthy treat. These zucchini muffins are my new favorite. They have a full cup of shredded zucchini (about 2 small zucchini) for 10 muffins, which adds a sneaky vegetable and keeps the muffins moist. They are full of protein from the eggs and almond flour. And they are perfectly sweet from a banana, honey, and warm cinnamon! I use mostly coconut flour for this recipe which is a huge nutritional plus. 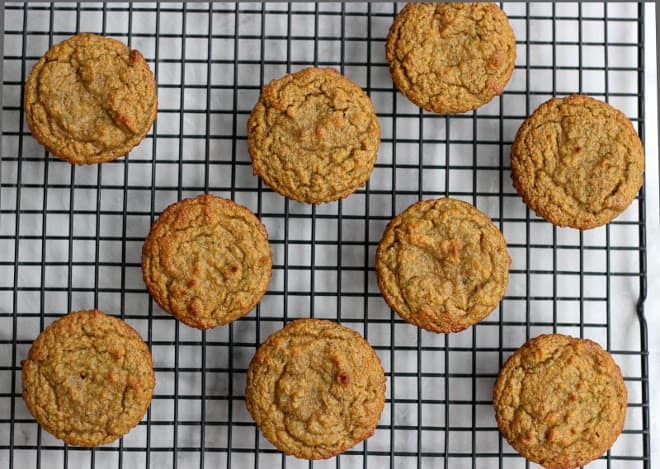 Coconut flour is lower in calories and fat then it’s grain-free cousin, almond flour. It also packs a healthy punch of fiber. I am still a big fan of almond flour, but it should be used in moderation as it does have a lot of calories. 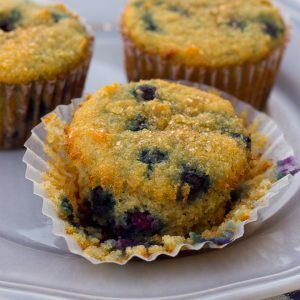 These muffins are a great introductory recipe if you are new to gluten-free, grain-free baking! I find people are always pleasantly surprised by how great paleo baked goods taste. We will definitely be making these with all the fresh spring zucchini that’s around this time of year. And I see double chocolate version of these muffins in my near future too! Preheat the oven to 350F. Fill a standard muffin pan with liners. Combine the coconut flour, almond flour, cinnamon, nutmeg, baking soda, and salt in a bowl. In the bowl of a food processor, pulse together the eggs, honey, vanilla, and coconut oil until well combined. Add the dry ingredients to the wet and pulse to combine. Allow the mixture to sit for 3-5 minutes for the coconut flour to absorb the liquids. Add the apple cider vinegar, banana, and zucchini and pulse to combine. Scoop the batter into the lined muffin pan. Bake for 20-25 minutes until a toothpick inserted into the center of each muffin comes out clean. Cool and enjoy! Keep leftover muffins in the refrigerator. This is a keeper! They are so moist and packed with flavours. This are awesome. Very moist. I added soaked raisins. These look really good! But I live in Norway and am unable to find coconut flour, is there a substitute I can use? I just threw some shredded coconut in my Vitamix to make my own coconut flour. I did the same thing with some raw almonds. This saved a lot of money. I took them to a breakfast meeting and they were a big hit. So glad they works for you! oh my heavens these look delicious. and I was going to make whole wheat ones this weekend! Just ordered almond and coconut flour off amazon. Super excited! These seriously look delicious and the pictures are amazing! Question, have you tried using flax or chia eggs with these? I’m trying to cook with less eggs to lessen inflammation, but some recipes don’t fair well to the flax/chia egg. Wondering if you’ve tried it or not. Best muffins I have ever made. My hubby loved them to!! I made these muffins yesterday and they are absolutely delicious. They are moist and light. I highly recommend making them. I’m glad they turned out for you!! I have 2 beautiful zucchini from my CSA ready to go and can’t wait to make this recipe! Thanks for posting and inspiring others to good paleo nutrition and health! Thanks Deb! I hope you like the muffins! These look really good!! I’m excited to try! Do you know if applesauce would work in place of banana?? I’m allergic to banana. Hi Amy! You could try 1/2 cup of applesauce. I haven’t tried it but I suspect it would work 🙂 I hope this helps! AMAZING!!! I made these for a crossfit competition – for my team to snack on between WODS and everyone loved them! So moist, so flavourful, so delicious! These are great – thank you! I just made a triple batch. I have made these twice now – so good! 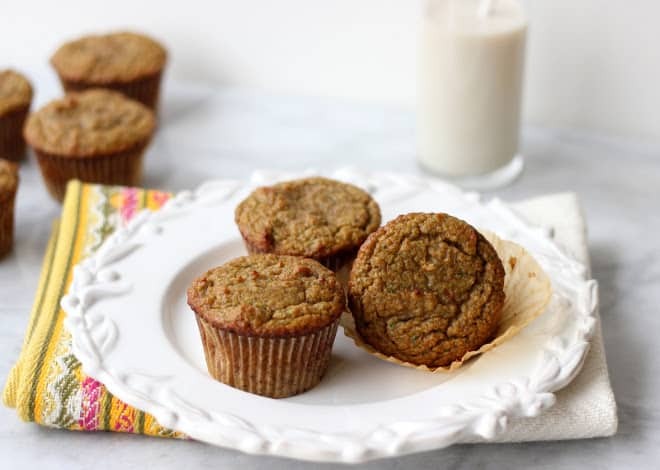 They are my favorite out of a few paleo zucchini muffins I have tried. I subbed applesauce for the banana b/c my bananas weren’t too ripe, still came out great. Made half of the batch with some mini choc chips – yum! I like the texture of these muffins. I find the biggest challenge of baking with coconut flour is finding the right ratio between the wet and the dry. These muffins are not too dry nor too soggy. However I made a minor adjustment in one of the steps. I didn’t let the batter sit for 3-5 minutes before adding the zucchini and the banana cause the recipes called for baking soda which is good cause we are dealing with acidic wet ingredients such as vinegar and honey. But baking soda is very time sensitive. The chemical reaction called carbon dioxide becomes active as soon as the battery is moistened. The bubbling reaction that causes the batter to rise only expands in hot temperature. So you want to put your batter in a preheated oven as soon as possible once the carbon dioxide is activated otherwise the batter will fall flat. I also added 1/2 tsp of psyllium husk powder with the dry and a tbsp of orange juice for extra moisture along with the wet ingredients. But I would definitely make these muffins again. What if I wanted to use only coconut flour and not almond flour? Would they still turn out? Unfortunately I don’t think so! Almond and coconut flour have very different properties. You could always try it though! I would add an extra egg if you do. I recently made these and they were wonderful! Because I couldn’t find our honey I ended up using maple syrup instead, which I think is an improvement on the original recipe. I have another batch in the oven right now, I’ve tried adding raisins and carrots as well. We’ll see how that goes. Also, because my son can’t take nuts to school, I just added about 2 tablespoons of coconut flour instead of the almond flour, and it was fine–more than fine, delicious! I believe 1 cup of regular flour = 1/4 cup to 1/3 cup of coconut flour, so a little goes a long way. That is great to know! Always nice to be able to make things nut-free if needed. So glad you like them! My toddler loves them too! Instead of vinegar I added a table of unsweetened applesauce! Great recipe though. Even the kids love them! I added dark chocolate chips, substituted applesauce for coconut oil and used two cups of zucchini instead of one. So delicious! I really like this recipe! At first I wasn’t used to nutmeg (which I think I never had any before), but the more muffins I had (at least 5 of them in 2 days), the more I felt like it goes with cinnamon really well. They are well light and health, I love the after-taste of coconut in my mouth. Yum! Now I want to try adding walnuts and chocolate too! I’m so glad you liked them! Do you need to wring out the zucchini for this recipe or is the wet from the zucchini part of the recipe? I usually just give mine a slight squeeze to get some of the moisture out. It doesn’t need to be really dry though. Hopefully that helps/makes sense! I made these muffins this morning. I put the batter in a greased mini muffin pan and baked for 10 minutes. They are perfect toddler-sized snacks. Thank you for this super tasty recipe! 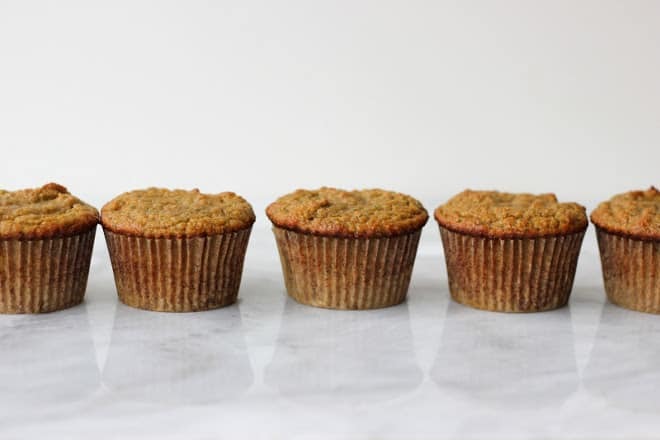 It’s the best grain-free/paleo muffin I’ve made to date! I made these with almost double the amount of zucchini because I grated too much and just threw it all in there and they were still amazing!!! Super moist and delicious. Will definitely make these again! Thanks! Anyone know what the calorie count is for one of these muffins? They are so delish! Wondering how many I can safely indulge in? I doubled the recipe and made 2 loaves instead of muffins. I baked at 350 for 50 min, checking after 40 min. I also added chopped pecans and walnuts to the too of the bread for baking. This is the best gluten free baking I have done so far!!! I’m in love with this recipe!!! This was my first attempt at paleo baking and I was disappointed. While the flavor was good, the texture was just off….way too soft and mushy. I even baked them an extra 10 minutes but it did not help. I’m sorry the muffins didn’t work for you! 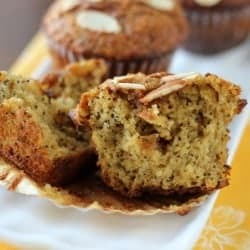 This is a tried a true recipe for me, but if your zucchini has too much water the muffins can turn out too soft. I usually squeeze my zucchini a bit to prevent this. I hope this helps! These are so good! 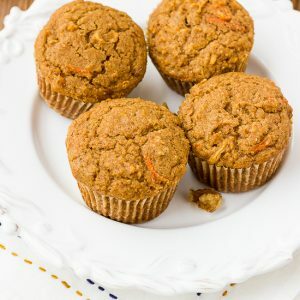 I have tried several paleo muffin recipes, and this is by far my favorite. Even my four-year-old likes them, and he is beyond picky. Can’t wait to try more of your recipes! I made these and they turned out great! I substituted one of the eggs with a chia egg without a problem. I ended up having to bake them for about 30 minutes (and they probably could have done another five but I was impatient!). Even my father who was reluctant to try them loved them so much he ate 2! Thanks for the delicious recipe! Wonderful Site- so very happy to have found you! Please help what can we sub for all the coconut ingrediants and honey. Few allergies over this way.. These are delicious! I added 1/4 c cocoa powder and 1/4 chocolate chips to make a decadent treat. Thank you! can I use this recipe without using the banana, also I don’t want to use applesauce, can I get away using neither those 2. Hi Lorena! I don’t know how it would work without the banana. You could try using pumpkin and increasing the sweetener slightly! I LOVE these muffins! I have been making these for months now and am so grateful for this recipe! Finally a healthy muffin I feel great about feeding my kids. I always have these on hand in the freezer! I make a batch, toss them in there and just reheat for 1 minute in the microwave at breakfast time! Thank you for this awesome recipe! Is there a sub for the banana? You could try using 1/2 cup applesauce instead. I think that should work! Hi there! Is the honey necessary or is it just a sweetener? Could maple syrup be used instead? Or nothing? I have to watch my sugar. Thanks! Maple syrup could definitely be used instead! I haven’t tried these with no sweetener. I would add 1/3 cup almond milk in place of the liquid sweetener if you try it because you need the liquid. Let me know how they turn out! I have been eating gluten free for about 6 years now. I have tried countless recipes and thrown many out… until now! I have made 2 of your recipes and they are delicious! And my toddler loves them! I can’t wait to try this one. Wondering if you have tried a “chocolate zucchini” recipe as my older daughter isn’t fooled easily. Would love to hear if you have any! I’m so glad to hear this! Thanks for letting me know! Yum! These are so moist and delicious. I realized I messed up and put 1/2 almond and 1/4 coconut flours but they still turned out! I just squeezed a bit of liquid out of the zucchini just in case. Thanks! Can one just use a spoon to mix/incorporate the wet ingredients and a spoon to mix the wet ingredients with the dry ones? I have a food processor but prefer to bake without using a sharp blade. These look amazing. So excited to try them! I did have a question: do you add the coconut oil in solid or liquid form? I’m assuming liquid, but why dirty another little bowl if I don’t have to, right?! Love these, they quickly became my go-to recipe for my 2 year old. Do you have the nutrition facts somewhere? Just curious what the carb count is per muffin, thanks!